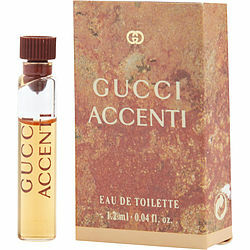 Juicy fruits mingle beautifully with soft flowers in Accenti by Gucci, introduced in 1995. This delightful women's fragrance lets you enhance your playful spirit, while clearly sending a signal of your commitment to elegance. Soothing sandalwood combines with the delicious aroma of freshly picked peaches and raspberries, and you'll also notice a hint of exotic vanilla beans. Spritz this exciting concoction in the crease of your arms and instantly feel inspired to tackle whatever lies ahead during the course of a busy day.